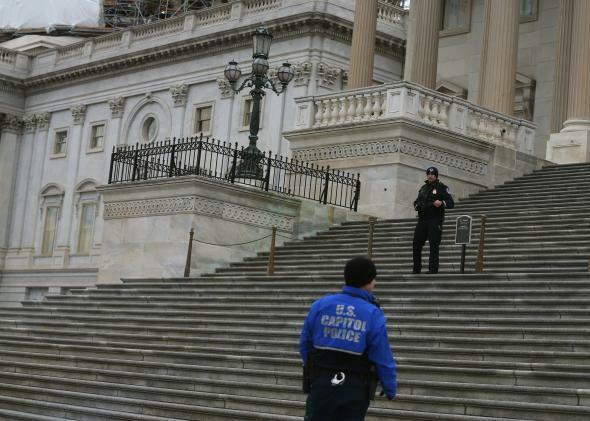 Man commits suicide outside U.S. Capitol. A U.S. Capitol police officer stands guard ahead of President Barack Obama’s State of the Union Address at the Capitol building on January 20, 2015 in Washington, D.C.
A man shot and killed himself outside the U.S. Capitol Building on Saturday. NBC News reports that the man died on the West Front of the Capitol Building and a suspicious package found nearby that led to a lockdown of the building was his suitcase. “There are no indications at this point of terrorism,” said a federal official. ABC News hears word the man had a sign taped to his hand.